November is the first month in which the manual investing feature was not available to users. The Portfolio Manager continues to be the most popular option for investors given its ease of use and automation. In November the Portfolio Manager represented 92.7% of investment inflows. 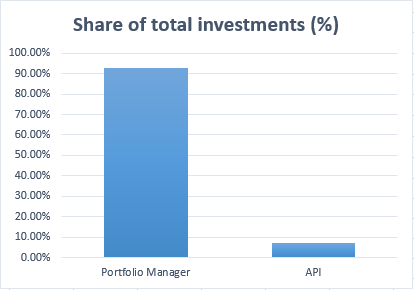 The API interface ended at 7.3% of inflows. This is a slight increase over last month when API represented just 6% of the total. Users can choose from a variety of risk tolerances when using the Portfolio Manager. However, in a recent post we discussed the importance of monitoring your portfolio even after making this selection. Taking an active approach is important because some high risk loans (HR) can appear even in a “conservative” portfolio selection. Additionally, an investor should not choose a more aggressive risk profile unless they are comfortable with higher expected loss rates. These riskier loans carry higher interest rates but at a higher chance of default.